The Savage® Model 10 .308 bolt-action rifle is a simplistic rifle as a sniper configuration. Firearm Features: Bolt-action. The BA-style bolt handle provides simple, lightning-fast cycling. Beavertail forend. Detachable box magazine. 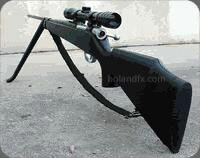 Includes a bipod, scope, sling and gun lock. Capacity: 4 rounds. Does not include blank ammunition.